A detail of the M-35 master map for the series including the Berezhany map. Source: WIG map archive. Following the Second World War and the subsequent political struggles in Europe, Rohatyn became part of the Ukrainian Soviet Socialist Republic and subject to the military administration of the Soviet Army. Map-making naturally fell under this hierarchy also, and for several decades no further maps of the Rohatyn area were available in the West. 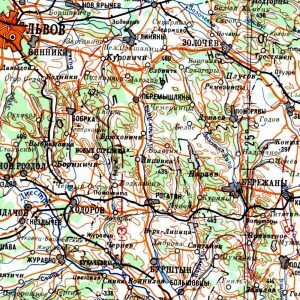 At the end of the Cold War, Soviet military maps should have been destroyed, but many were de-classified and sold; some are now in circulation. The 1978 topographic map scan on this page was available for free on a few websites several years ago, but now is only available through pay sites or in fragments. 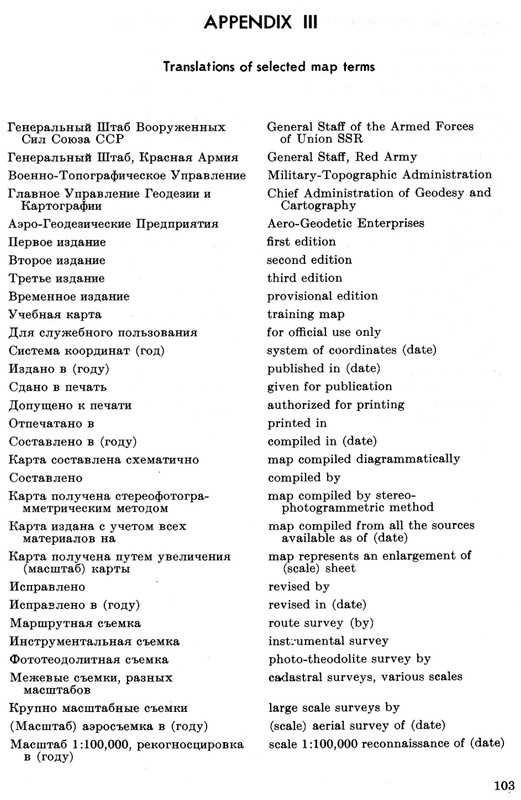 A page from the 1958 US Army manual for interpreting Soviet maps. Source: Internet Archive. Although the map scan is of low resolution, the image is still quite readable. Numbered M-35-86 in the Soviet grid system, the head city on this sheet is Berezhany, with Rohatyn the next largest city shown. Designed at 1:100,000 scale, there is enough detail to study changes in the built features of the landscape, for example the evolution of roads from before this map was made, and to the present day. 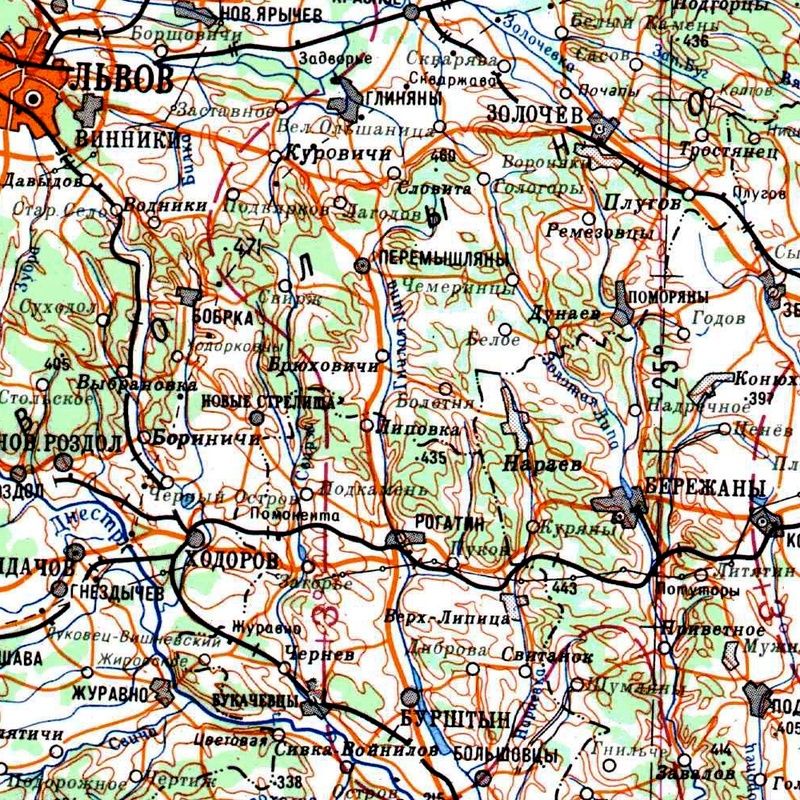 The map is labeled as originating with the General Staff (of the Armed Forces of the USSR). 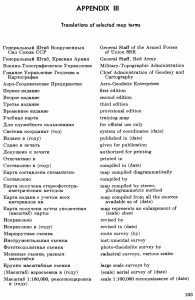 The 1978 print edition originates with a coordinate system devised in 1942 (when the Soviets first held these lands), surveyed in 1949, and revised in 1976 under the command of colonel A. D. Fadeev. Labels and symbols on the map still followed the Soviet topographic map system developed before World War II and documented in U.S. Army Technical Manual TM 30-548, a 60-year-old aid still useful in map interpretation. This 1978 map is the image presented in an overlay on Bing Maps satellite data from the contemporary town. The image is interactive: pan and zoom are available with ordinary mouse controls or gestures, depending on the device, and zoom is also available by the +/- buttons in the upper left of the display. The map can be made transparent in 10 steps by sliding the control in the upper right of the image. This 1978 topographic map is one of a series of historical map overlays included in the project Mapping Rohatyn: Geography as an Education Resource.